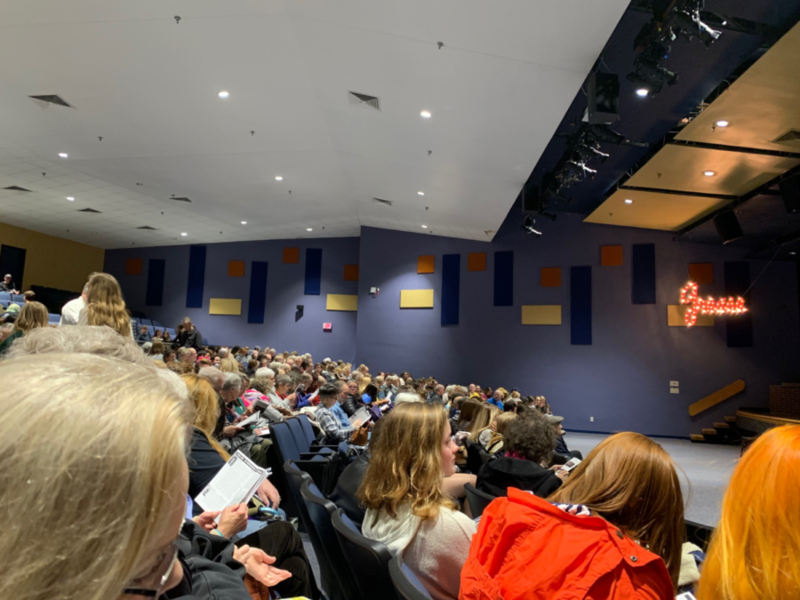 The audience fills the Lafayette auditorium anticipating another amazing school play. The curtains open to leather jackets, greased hair, and five singing boys. The spotlight hits them and they dance as if they’re in the 1950’s. The school production of Grease is on! 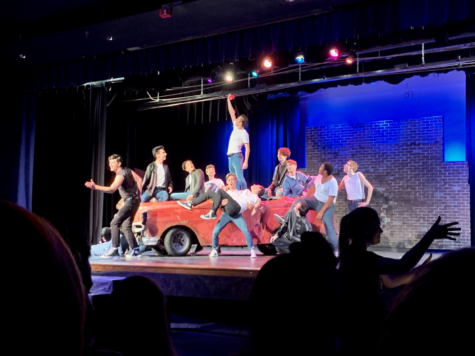 Directed by theater teacher, Mrs. Suzan McCory, Grease begins with Danny, played by senior Avery Walters, goofing around with his friends, played by Jeff Figgs, Caleb McNabb, Winston Stanley, and Micah Wills. Danny met a girl over the summer and his buddies are asking for details through song. On the other side of the stage is Sandy, played by Maddi Overy. She is telling her new girl friends, played by Addie Lawrence, Hannah Kitrell, Maddie Linn, and Marina Earle, about the boy she spent her summer with. The two main characters, Danny and Sandy, run into each other at school on the first day, and their on-and-off relationship continues throughout the play. 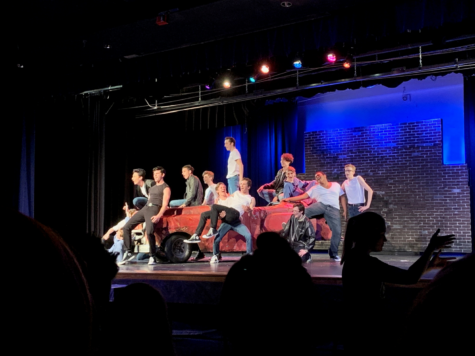 Lafayette’s production of Grease features various side stories, including pregnancy and dropping out of school, an incredible dance scene done by Ariana Gonzalez and Avery Walters, impressive gymnastics done by Jeff Figgs, three of Lafayette’s own teachers, and one too many kisses. Avery Walters and Maddi Overy sing a duet as their characters’ stories collide. 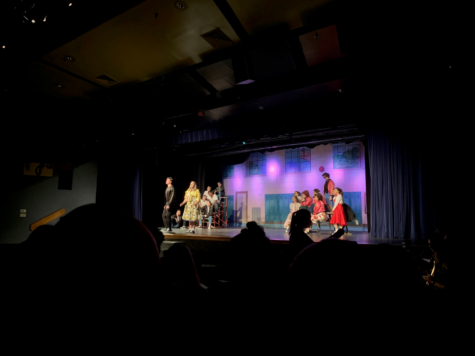 I spoke with the cast during tech week and dress rehearsals, and many told me that they were worried about opening night because they usually had more time to practice. 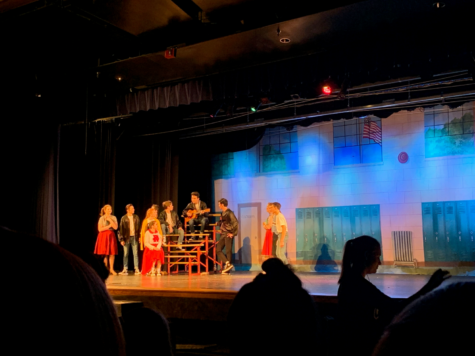 In previous years, the school play was showcased in April; however, this year it was performed from Thursday, March 21-Saturday, March 23. I attended the opening night production with low expectations due to the concerned theater students, and was pleasantly surprised. The singing by all of the characters was excellent, especially Maddi Overy. Maddi is a sophomore with enormous potential for future acting roles. She has been acting for several years and she crushed her role as Sandy. From her confidence to her voice, Maddi Overy was the perfect choice for her character. The other lead actor, Avery Walters, was also impressive. Avery has never acted in a school production before this. He especially dove into his character by dying his blond hair and eyebrows black a few weeks before the show. Avery also has incredible potential and I would be disappointed if he didn’t continue to act in college and beyond. Surrounded by his friends, Caleb McNabb plays the guitar. Another positive aspect of Grease was the gymnastics and dancing. In every scene, the choreography was remarkable. During large dance scenes where tons of people were on stage, the unity between all of the actors was incredible. Jeff Figgs, a senior and a gymnast, did several cartwheels and flips on stage. Jeff got his wish during the play’s dance competition, in which Avery Walters and Ariana Gonzalez displayed fantastic moves that involved Avery picking up Ariana and spinning her around multiple times. Jeff Figgs and his crew sing and dance around their car on stage. “The scene always stressed me out because the lifts are difficult and we haven’t practiced them a lot because of my foot injury,” Ariana said, offering her perspective on the dance. Ariana has ambitions of becoming a professional dancer. “The show was basically our first time doing the whole dance. It’s a really fun scene and the cast always cheers us on, which makes it ten times better”. Jeff Figgs prepares for another flip as his crew sings and dances around him. Ariana was right, there were technical difficulties regarding some of the actors’ microphones on opening night. The small microphones worn on their ears created occasional fuzziness in actors’ voices and sometimes did not work at all. 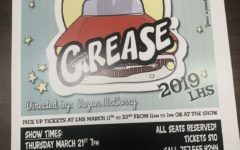 Another concern regarding Grease is the message behind the story: a girl should be willing to abandon her true identity and values and change in order to attract, and keep, her boyfriend. Although the script was written in the late 1970’s, it was decided by Lafayette staff to perform the play even though it is sexist and outdated. Overall, the message of the play leaves a bad impression on teens and encourages the wrong values in society. However, the incredible acting, entertaining choreography, and beautiful sets all deserve praise. Good job to Lafayette students on another successful play!